If you want to save fuel, money or the planet, electric cars could offer the solution. They're also becoming the mainstream; by 2021 it's anticipated that most manufacturers will have a fully electric offering, and ultimately all cars may be electric by 2030. The Government has just announced reductions to the plug-in car grant, too - the subsidy that encouraged electric vehicle sales - so secondhand models represent an even bigger saving over new now. The revolution started almost six years ago, with the pioneering Nissan Leaf joined by the small and affordable Renault Zoe, then rapidly followed by effective offerings from most mainstream manufacturers. Early, small-range EVs like the Mitsubishi i-MiEV and related Peugeot and Citroen models are now available for a little more than £5,000. Residuals on electric cars are still remarkably good – though discounts on the Renault Zoe can make a secondhand example less appealing – so finding a bargain can take some time. Going down the more flexible route of a plug-in hybrid retains the ability to have zero local emissions and exemption from congestion charging, without the associated range anxiety, so we're including those in your electic options. Arguably the first mainstream, affordable battery electric vehicle to really find consumer approval, the Leaf is a new design that inherits components from existing Nissan models underneath; derived from, rather than based on, the same platform as the Versa and Juke makes mass production simple. In fact, the Leaf is one of the UK's export success stories, as Nissan's Sunderland plant has built the Leaf for European markets since 2013, and continues to build the new 2018 Leaf. Families will like the large five-door hatchback design with raised rear seats for improved passenger visibility, while the 100 mile range is enough for most urban trips. Leaf choices - 24kWh or 30kWh? 24kWh models were joined by a 30kWh version in 2016, with a claimed range of 155 miles. These also benefit from an eight-year, 100,000 mile warranty on the battery pack, so are worth seeking out. Leafs require very little maintenance, with many still on their original brake components after 60,000 miles, thanks to the regenerative system, and battery lifespan is exceeding expectations. Even so, Nissan have reduced the costs of a replacement battery significantly, further increasing the appeal of a pre-owned Nissan Leaf. Many Nissan Leafs have leased batteries, so check the additional monthly costs you may incur before buying. Read our long-term review of the Nissan Leaf to see how the latest version of the electric hatchback copes with daily life. Like the Leaf, the Zoe is an electric car that owes a lot of the body design to existing practices, but isn't a conversion of an existing model; it falls between a Clio and a Megane for interior space despite compact exterior dimensions, and has touches like singing a little electronic song at low speeds to warn pedestrians. Unlike the Leaf, the Zoe fits into the landscape without drawing attention to itself, and is relatively conventional inside as well. It's also an affordable car with some low-rent trim details and fairly basic specification – which partly explains why you can buy a new Zoe for as little as £14,000 after discounts, and a list price of £22,920 before the Government plug-in car grant. Partly – the other aspect is that some models of Zoe have a leased battery pack, which generally involves a cost around £49-89 per month for the 22kWh, and £59-£110 per month for the 40kWh. The scale adjusts with mileage and includes roadside assistance for all breakdowns, not just failure of the battery; the £110 cost is for unlimited mileage. New Zoes without the battery lease cost £6,600 more, which is reflected in the used values. Renault Zoe - Q or R? Prior to 2015 the Zoe used an 88hp motor and 22kWh battery pack which allowed quick charging using all available power – between 30 minutes and nine hours, typically. After 2015, a new motor was offered as the R240, with an improved range but slower charging. To differentiate the models, the output was prefixed with Q on quick-charging models. In 2016 the 41kWh ZE40 joined the range, in 75 or 90hp outputs – though quick charging remained limited to the 88hp Q90 models, which gained the 41kWh battery as well. The most recent Zoe release is the 2018 R110, with a 110hp motor for improved performance. 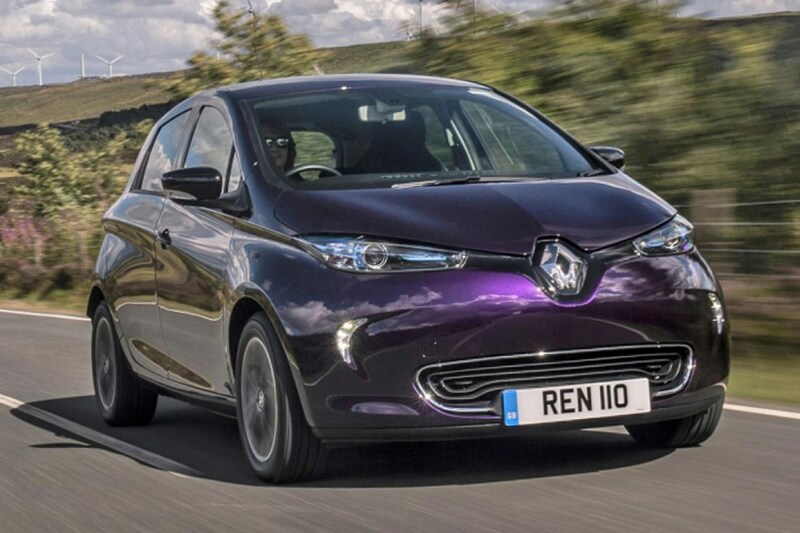 Read our long-term review of the Renault Zoe ZE40 Q90 to see what it's like day-to-day. Looking for a truly high-tech electric car? The BMW i3 is a genuinely clean-sheet design, without compromises to shoehorn EV technology into an existing platform. Based around a carbonfibre bodyshell and hemp-reinforced plastics, light weight and efficiency are central to the i3 concept. That doesn't mean it's a glorified Golf Buggy. Supercar technology extends to double-wishbone suspension and genuine BMW driving dynamics – the i3 S is a rapid little hatchback, and all models achieve great ranges for their given battery capacity. Despite being launched with just 22kWh capacity batteries, the i3's range is around 100-120 miles – or over 180 miles for the range extender. It looks different and futuristic too, with wide-opening pillarless doors for access to the two rear seats, and an architecturally-inspired interior full of pleasingly tactile details, including exposed real carbon fibre. You can find the generator-equipped range extender REx for around £16,000 if you shop around – which frankly, has no downsides – but we do recommend looking for later or upgraded specification batteries. Early i3s had a 22kWh battery; later models offer 33kWh with an additional 40 miles of range. BMW in Germany offered an upgrade - in the UK most owners elected to trade the car in for the newer model, so an official route is yet to be provided. Combining the best of electric power with a traditional - or, at least, mostly traditional internal combustion engine, plug-in hybrids can handle shorter commutes without local emissions, but have the ability to drive long distances without the inconvenience of equally long charge times breaking up the journey. Although an oily, fuel-consuming engine is installed the mileage covered may involve far less wear than on conventional cars; as long as the vehicle you're looking at is in good condition, we recommend being less concerned about the digits on the dashboard here. For drivers concerned about their immediate environment, they offer the best compromise and still avoid congestion charging in London. We've already explored the Vauxhall Ampera as a used buy here, and it is the lowest-cost plug-in hybrid you're likely to find when looking for electric vehicles. This does not reflect the quality or effectiveness of the hybrid system – in fact, it's one of the better systems, and the only car here not adapted from a conventional car. The bespoke nature of the Ampera, plus relatively few sales in the UK, suggests that it might be hard to live with; Vauxhall provide decent backup for Ampera owners and there's a thriving community of Ampera and Volt owners in the UK and globally. Why does the Outlander get only pros? Because everything negative that can be said about it is a matter of taste; the styling is a little bland, the handling is a little soft – nothing, really, that should put anyone who wants a Mitsubishi Outlander off buying it. And that's key to why it's in our list – it's such a good solution that it's been one of the most popular plug-in hybrid cars sold in the UK; there's a ready supply of them and dealers are familiar with all aspects of them. Real-world ability is impressive, too – they're capable 4x4s with controllable low-end torque and the benefit of individual motors for each axle. Running costs really do vary greatly with use, but as the worst-case scenario you'll find fuel consumption comparable to a much smaller, two-wheel drive SUV, and in the best situations the clever engine management will ensure that last-mile urban drives and short commutes never bother the engine. If you want a hybrid and don't want the neighbours to spot it, the Volvo V60 Pure is a stealthy way of putting the future on your driveway. It looks like a regular diesel V60, with a 2.4-litre five-cylinder engine producing 211hp – but underneath, there's an additional motor, all-wheel drive and a 31-mile range battery pack that can either boost overall power to 285hp, or operate in pure EV mode. 0-62mph in around 6.1 seconds and handling close to the abilities of the regular V60 R-Design ensures this is no apologetic eco-warrior, either – though it will save you money at the pumps if used in hybrid mode; a claimed 155mpg versus the 48.1mpg of the regular V60 diesel. The additional hardware adds 300Kg to the car, which does affect how nimble it feels in town – and it's not the most seamless hybrid implementation we've driven. Nevertheless, it's a subtle, capable and well made car worth seeking out.